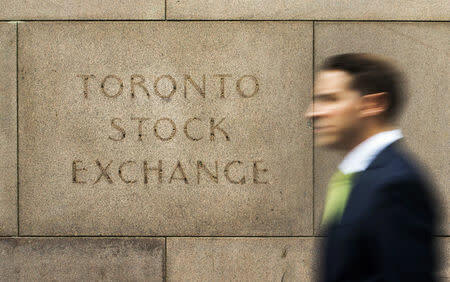 (Reuters) - * The Toronto Stock Exchange's S&P/TSX fell 141.87 points, or 0.95 percent, to 14,795.13. * Lagging shares were Aphria Inc , down 8.2 percent, Shopify Inc, down 6.9 percent, and Canada Goose Holdings Inc, lower by 6.9 percent. * Leading the index were Eldorado Gold Corp , up 9.2 percent, New Gold Inc , up 8.6 percent, and Aurora Cannabis Inc , higher by 7.8 percent. * On the TSX 81 issues rose and 156 fell as a 0.5-to-1 ratio favored decliners. There were eight new highs and 17 new lows, with total volume of 310 million shares. * The TSX's energy group rose 1.6 points, or 1.09 percent, while the financials sector slipped 2.88 points, or 1.02 percent. * West Texas Intermediate crude futures rose 1.92 percent, or $0.99, to $52.48 a barrel. Brent crude rose 2.51 percent, or $1.51, to $61.57. * The TSX is off 8.7 percent for the year.